Many of the art collector customers at Red Rag ask about caring for their contemporary British Art after it leaves the gallery, so here are what we hope are some helpful tips on the care of British art. There is an inevitable aging process that affects art over the years. For most of us this will not be a problem. But for future generations if you follow Red Rag British Art Gallery's advice it should mean your British contemporary painting remains an admired family art possession today and for many years to come. Contemporary paintings and their frames are made from many different art materials. These include: varnish, paint, glue, canvas, wood, metal, gilding and plaster. Most of the art materials in modern British paintings respond to changes in relative humidity and temperature by expanding and contracting. If the relative humidity keeps on changing then the painting will expand and contract. Eventually it can be become stressed and begin to deteriorate. Symptoms to look for in paintings are: paint layer cracks; canvas splits; wood splits; flaking paint. To prevent deterioration and damage British Public Art galleries and museums control the environment with air conditioning and temperature control systems. This is not a practical solution for most private art collectors, so in the home a painting can be affected from high and low humidity. 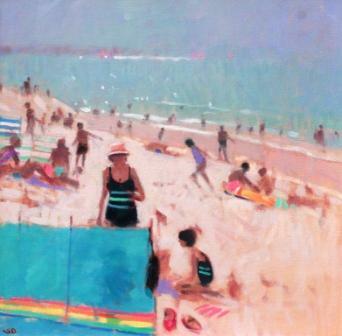 However, the British climate is generally favourable towards contemporary and antique paintings. During the summer well ventilated homes create a good environment for paintings. And although historically, the British winter months were once a concern because rooms suffered from damp and high humidity encouraging mould or mildew ' these days effective central heating has stopped these problems. So generally unless your central heating is seriously over heating and drying out the air there is little to be concerned about in terms of heat and humidity. For those British Art enthusiasts still seriously concerned about the environment around their paintings aim for a constant temperature between 65 and 75 degrees with a relative humidity of no more than 70%. All contemporary paintings can be adversely affected by excessively high levels of sunlight. This can cause fading and/or darkening of contemporary paintings and cracks in the paint. After many years some paintings can darken so severely that the painting and its details are no longer visible. Direct sunlight and harmful UV rays should therefore be avoided where ever possible. The suggested light level for contemporary paintings is 200 lux. Light levels can be measured in some cameras using the light meter. Ideally to avoid damage caused by sunlight, paintings should be displayed in dim areas where no or little direct sunlight is allowed to fall on them. Paintings can be harmed by excessive heat levels. Problems can be compounded if there is also poor air circulation. Extreme or rapid changes in temperature cause paper and wood to warp and dry out and make adhesives fail. Care should therefore be taken with the positioning of picture and spot lights. Lights that are mounted to the painting frame or directly above it should be avoided. And depending upon wattage, spotlights should be mounted at least three and up to ten feet away from paintings to avoid potentially damaging heat buildup. Placing paintings immediately above radiators or fireplaces where temperatures maybe excessive should also be similarly avoided. Grime and dusty environments can be a cause of problems to contemporary art paintings. Grime and dirt obviously looks unsightly on paintings but may also be acid in composition. If so the acid can speed up the breakdown of art canvas and wood frames making them brittle and more vulnerable to knocks and blows. Ideally contemporary paintings should be kept away from areas where oily soot is in the air (near a kitchen) or where there is a possibility of any type of accidental leakage occurring such as pipes or air ducts. Carpet beetles - generally subsist on protein-based materials sometimes found in art materials i.e. canvas paintings. Beetles are most often are found at the back of the paintings between the canvas and stretcher. Holes in the canvas or the presence of worm-like insects or furry carcasses are an indication of problems. Powder post beetles - typically bore small holes (approx. 2mm in diameter) into wooden materials. These holes are generally the first visible evidence of powder post beetle infestation. Thunder Flies - seem to affect paintings hung near door ways in British Countryside properties. They manage to get under the glass and although harmless can be unsightly. They can be removed easily by our British Art Gallery Framer. Paintings should be routinely taken down and examined for pests. If evidence of infestation is found, the object should be placed in a plastic bag and isolated until it can be examined by a professional conservator. Making sure paintings are stacked vertically and the right way up. Contemporary paintings with glass or those with fancy frames can be heavy, you may need two people. Occasionally you will want to clean your painting. A soft cotton cloth or brush is suitable for dusting the frame, and a soft bristled brush should be used to dust off the painting itself. Never wash a painting with a moist cloth as the moisture can eventually leave a white film. Do not use cleaning fluids or water on the varnished surface of oils paintings. If cleaning fluids have to be used on the glass apply to a duster rather than directly onto the glass. Keep the fluid away from the frame. Avoid dusting any areas of the painting that are flaking or coming separated from the canvas. Although cracking can be treated with special solvents, we do not recommend that you apply any liquids at all to your painting as even the proper cleaning solvents can cause irreparable damage if applied incorrectly. Customers of Red Rag often ask why some contemporary paintings have glass whilst others do not. In some cases the answer is just tradition. For example Scottish Artists have traditionally used glass around Oil paintings. There are also practical reasons such as when an artist wants to protect oil paint which is still wet. But increasingly British Artists are choosing to glaze their paintings. One English artist who now presents his art work under glass is Stephen Brown - he feels using glass enhances the appearance of the paintings. Glazing protects the surface of contemporary paintings and reduces the infiltration of light, dirt and dust. The two most common glazing materials used to frame Red Rag British paintings are acrylic sheet but more likely glass. An acrylic sheet weighs less than glass and is shatterproof. Because acrylic has a static charge, glass is always used when framing powdery materials such as pastel paintings. Whether it is glass or acrylic, Red Rag British Art Gallery makes sure that the glazing material does not come into direct contact with the surface of the contemporary painting. Prolonged contact of the glazing with the surface of paintings can result in adhesion to the glazing, or can cause surface changes in the art work. A thick mat or a spacer in the frame keeps the painting from touching the glazing, but a regular annual check is advised. If you are intending placing a painting in areas of strong sunlight glazing that filters ultraviolet radiation can help reduce the fading of colours. Both glass and acrylic sheet that filter out ultraviolet radiation are available. However paintings glazed with ultraviolet filtering materials can still be damaged by high light levels and long periods of exposure. Limit the quantity of light and the duration of exposure to light to minimise damage to paintings. The above is really an 'ideal'� for those wanting to do everything possible to protect their contemporary art. Certainly if you follow all the Red Rag British Art Gallery suggestions you and your descendents will be assured years of trouble free enjoyment with your British Art investment. Most people will tend to leave their contemporary paintings on the wall for many years ' without noticing or experiencing any serious ill effects. 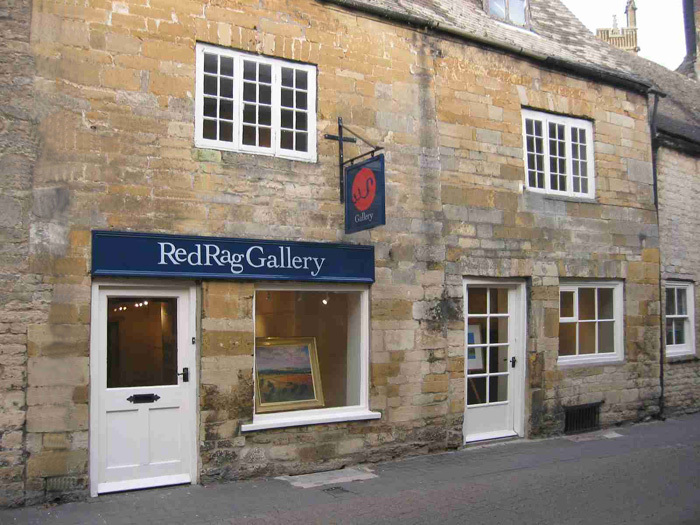 Remember above all your British Art from Red Rag Gallery is to be enjoyed!